Pier Park Pick-Up 2016 volunteers pose for the group photo. April 23rd was the perfect day for the annual Pier Park Pick-Up. 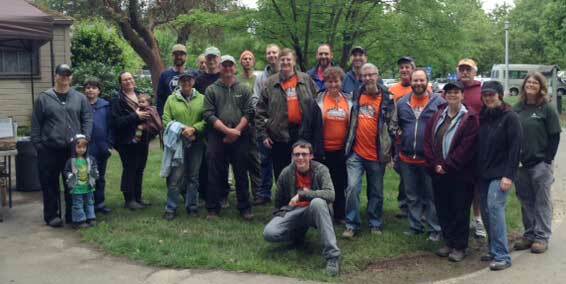 Volunteers from the disc golf community, New Seasons, TriMet, Community Inspired Professionals, and SOLVE came out. In all, 26 adults and six youth participated, clearing a 1/4 acres of blackberries and ivy and removing 15 bags of trash. Healthy treats and coffee were donated by New Seasons and Starbucks. Volunteers also enjoyed Tulip Pastry donuts. Along with the invasive plant and litter removal work, volunteers built a trail for disc golfers between holes 7 and 8 and stairs from an apartment complex to make access to Pier Park easier. For volunteers who wanted to paint there was an additional project – 40 picnic tables were painted and refurbished just in time for warm weather parties and reunions. The most interesting pieces of litter found were two canisters of paintballs!